With the new 103 mm MX last, Dalbello brings the classic razor-sharp freestyle performance of the Il Moro to the wider-footed masses. 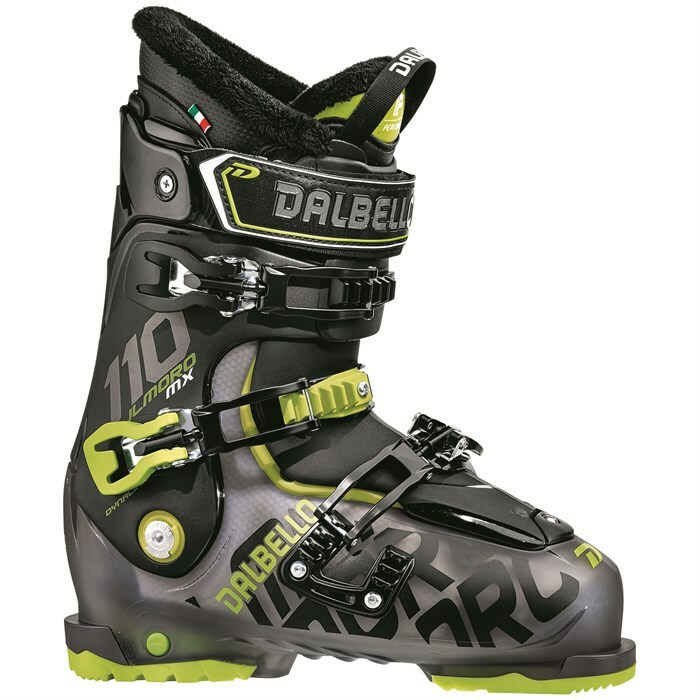 The Dalbello Il Moro MX 110 Ski Boots will convince you of the value of the 3 piece Cabrio design in just a few short runs, and it's all downhill from there. The new 103 mm last is surprisingly roomy and fits even hobbit feet well, so if you're looking for your next pair of stompers you owe it to yourself to check the Il Moro MX 110 out. Last: 103 mm  Wide fitting last combines an expanded volume forefoot and toe box area with a closer fitting rearfoot and ankle area. Comfortably accommodates a wide range of foot shapes with max foothold and exceptional comfort. 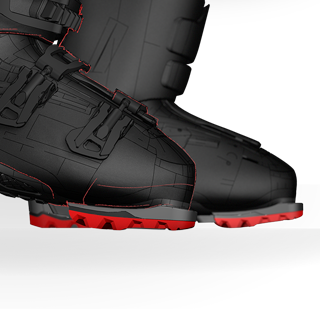 Contour 4 Shell Fit  Contour 4 Technology is a revolutionary technological advance in performance ski boot fitting. 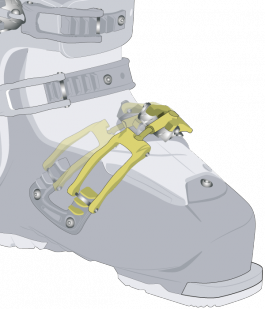 The anatomical contours of the inside sidewalls of the boot-shell, as well as the innerboot lasts, are precisely “mapped” to the shape of the typical high performance skier’s foot. 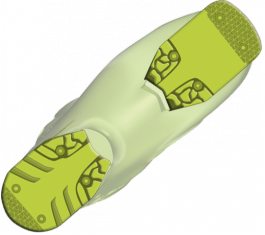 A little extra “space” is molded into the inside of the boot shell at 4 critical fit points: ankle, heel, 5th metatarsal, and navicular. Cuff Hyperband  This wide profile shin pad offers extreme versatility, low friction and fit & function. Split Fit Tongue  Dalbello’s Split-Fit Tongue has a unique fore-aft sliding design that allows the tongue to accommodate a taller instep comfortably. The sliding function also allows for extremely easy entry and exit. Flex: 110  Stiff but not too stiff, this flex is the perfect compromise between all mountain mobility and big mountain control. Kinetic Response Tongue  Highly resilient polyamide flex ribbed tongue stays in permanent contact with the leg for improved responsiveness and control. Interchangeable flex stiffness. IF Performance Liner  These liners are 100% pre-formed and ready for try-on and ski right out of the box. Ulteva foam is a pressure sensitive material that will automatically form to the foot over time. It is similar to memory foam, only more supportive and resilient. 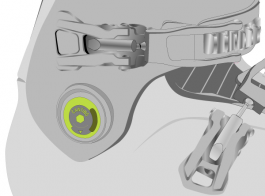 Total Landing Gear Tongue  Revolutionary XRD material is strategically placed in the shin area of the tongue to absorb impact for less fatigue and eliminate shin bang. Cabrio Design Architecture  Dalbello's 3 Piece Cabrio Design architecture has been the cornerstone of their performance, all mountain and freestyle models for more than a decade. 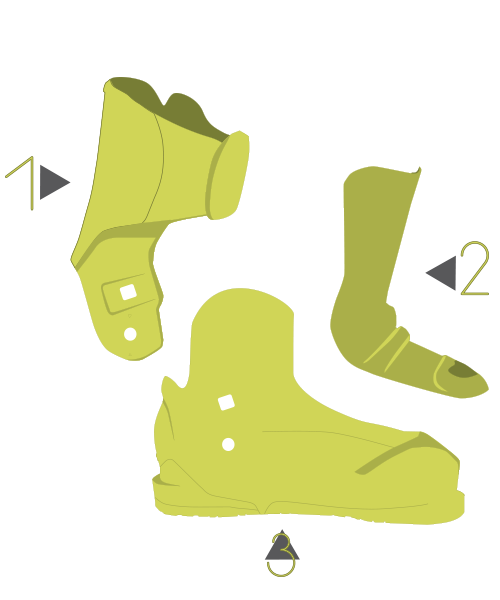 This unique construction combines a 3 piece construction assembly - shell/cuff/tongue - that comfortably secures the foot and lower leg while optimizing smooth and progressive flex. Dalbello's Cabrio models provide the ultimate in responsive performance to ski your best. Cabrio Design permits the use of stiffer and more rigid plastics in the lower shell. This strengthens the support around the foot and lower leg providing quick response and precise transfer of power to the ski edges. 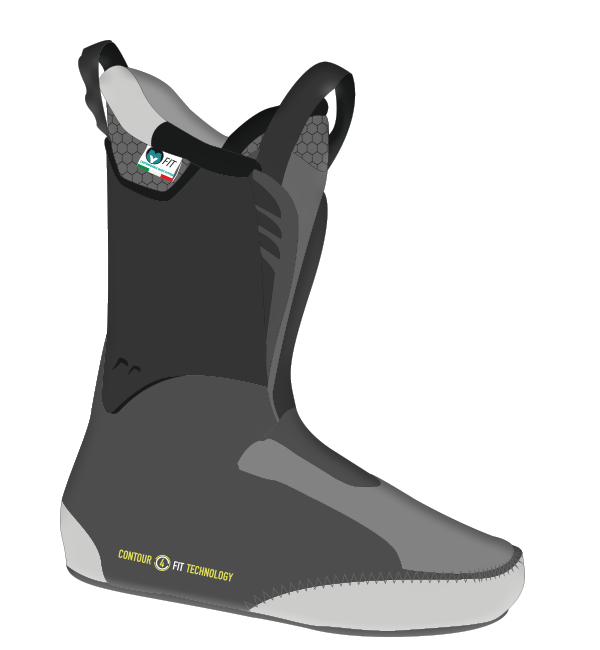 This design also prevents the lower shell from distorting and bulging as the boot flexes, making the boot more smooth and stable at high speeds and on irregular terrain. 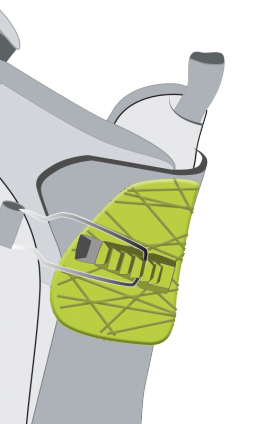 Total Landing Gear Cuff  Softer PU material spans a “V” cut in the upper cuff providing a slight amount of stretch to absorb landings without compromising performance or control. 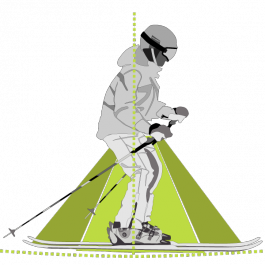 Dynamically Balanced Stance  Foot angle, cant angle, and cuff inclination engineered into the shell and cuff positions skiers in a balanced and centered stance for optimum dynamic performance. 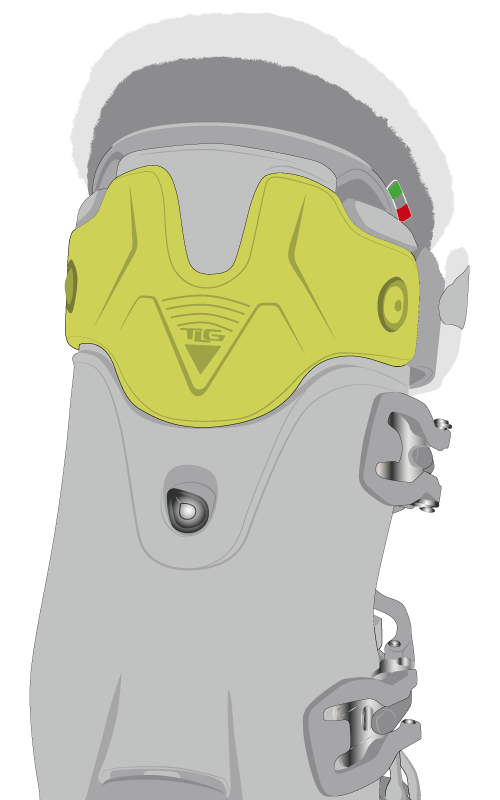 Adjustable Cuff Alignment  Permits skiers to align the lateral inclination of the upper cuff to the skier’s leg. 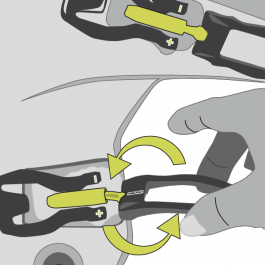 Outside Hinge Cant Using 5mm Hex Tool, rotate the mechanism clockwise, or counterclockwise, to align boot cuff to desired position. 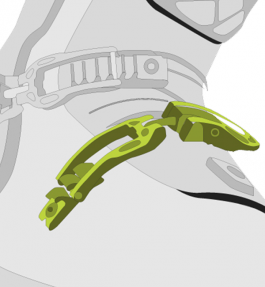 Low Cuff Hinge Point  High leverage cuff assembly with hinge points mounted approximately 10 cm lower than standard construction boot designs. 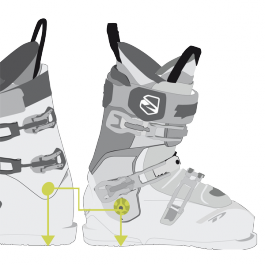 The low hinging cuff permits the boot cuff to more easily follow the natural movement of the skier’s legs because it has a longer range of forward and rearward hinging motion. Micro-Adjustable Aluminum Buckles  A simple turn of a buckle! Micrometer buckles are easy to use for easy fit customization. 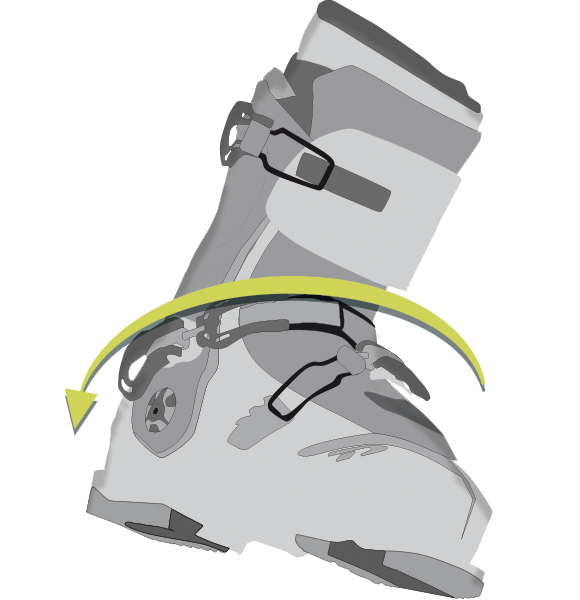 Dynalink Rearfoot Retention  Dynalink is an independently functioning heel/instep closure band assembly that secures the skier's foot in the middle and rearfoot sections of the ski boot. 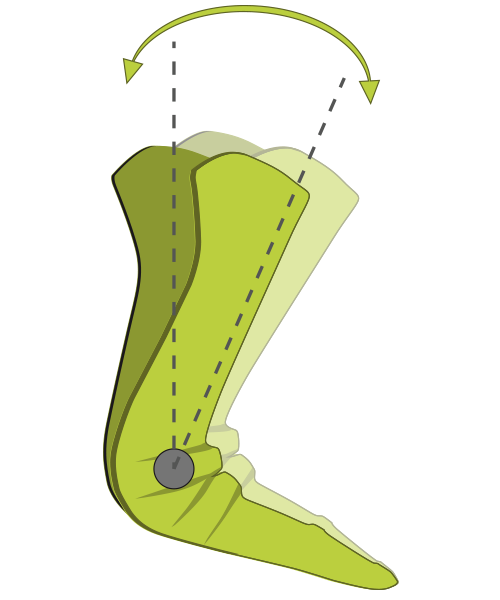 During boot flex, the Dynalink band does not permit the foot to slide forward or the heel to lift lifting inside the boot shell. 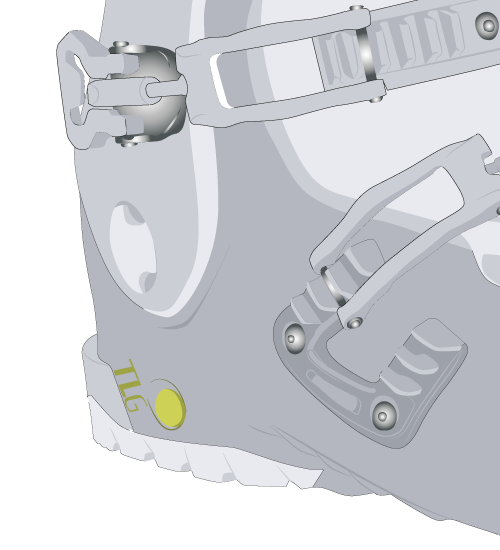 Inverted Forefoot Buckle  Forefoot closure buckle above the instep is inverted and designed to close on the top of a boot shell, not the side. The top closure positioning prevents buckle breakage and bending during rail slides, grinds, falls, and transitions. 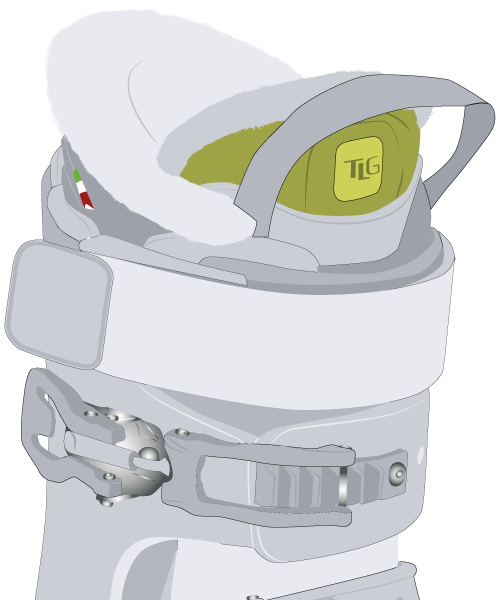 Twinstep Closure  Two position buckle closure allows for optimized pressure distribution over the instep. 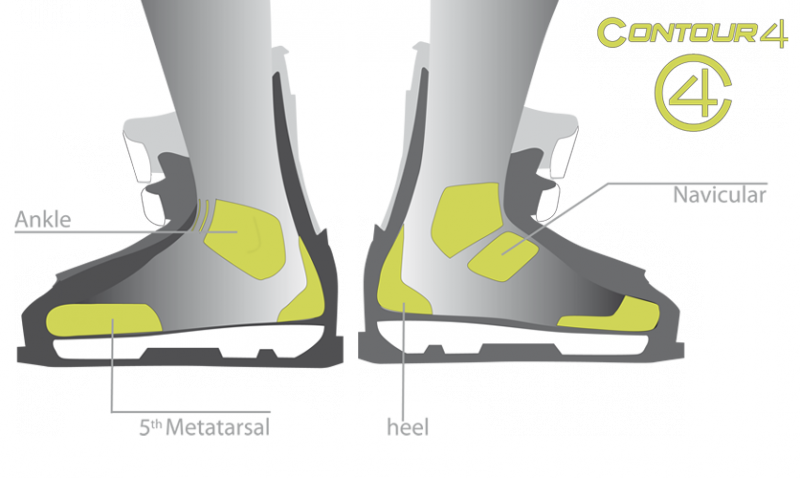 Total Landing Gear Heel  XRD material absorbs shocks and vibrations for smoother skiing and less fatigue. Dura-Grip™  Replaceable, durable high-durometer polyurethane toes & heels for extended boot sole wear. Grip Walk Outsoles [Sold Separately]  Provides increased safety and improved natural roll thanks to a curved rubber sole and includes a high-profiled, slip resistant sole.